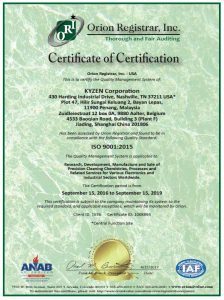 KYZEN Corporation, and our international operation facilities in Europe, Malaysia and China, have been assessed by Orion Registrar and found to be in compliance with the ISO 9001:2015 quality standard. ISO 9001:2015 is an update to the ISO 9001:2008 family of standards for quality management systems and is an internationally recognized certification. It is maintained by the International Organization for Standardization (ISO) and is administered by accreditation and certification bodies. An ISO certification demonstrates that the company or organization certified has consistent processes that are being applied. These processes are documented extensively within the ISO system of quality management, which is represented by the ISO certification. This gives customers assurance of proper quality control, eliminating the need for additional audits to confirm the appropriateness of a company’s quality management system. For more information about ISO 9001:2015, please visit http://www.iso.org/ . Kyzen’s ISO certificate can be downloaded here. Kyzen’s Quality Manual can be downloaded here.